The Flingshot Slingshot Flying Screaming Monkey can be launched like a slingshot. The arms are made of rubber tubing and the hands have slots where you can put your fingers. Just pull back the feet and tail and the monkey flies up to 15 metres (50ft). The included battery allows the monkey screams out like Tarzan when it flies. I remember when I was a little girl and I saw the movie the Wizard of Oz for the first time. I loved Dorothy and Toto, and the magic of the Land of Oz but that green-faced witch was very scary. Even more frightening were the witch’s evil servants, the Winged Monkeys! I had nightmares about those things for weeks afterwards! Fast-forward to the scenario of me at work, quietly typing away in my cubicle, looking up, and seeing a screaming monkey flying across the office. I’d definitely be having more nightmares. Too funny! I actually have 3 of these ridiculous monkeys. My husband and I were just talking about them yesterday. I have a chronic health condition and these ridiculous, obnoxious monkeys provide hours of enjoyment for me and my daughter. You’d be surprised how many ways you can play with these monkeys from the confines of a bed with a very active preschooler. We have strict rules about where they are stored for the night because that screaming is horrific. Normally I laugh along with you at the ridiculous one task items people buy. These monkeys however are a different story. They are LOADS of fun, especially when you have several of them and can run around shooting them at each other – think, snowball fight without the need to get cold and wet. Oh, and cats either love chasing them or are terrified of them. See, there’s more than one use right there – kids toy, kid-at-heart toy, and cat toy! Oh I love this thing! I have fond memories when my mom was sick in the hospital and her extended family was gathered around in her hospital room. Things can seem pretty grim in a situation like that, but someone brought out one of those monkeys and shot it across the room. My mom laughed and laughed, and so did all of us! It was a special moment of bonding and levity for us. The grandparents bought a few of these a few years ago, but every time one was launched my oldest son (then 2 years) started to cry. This fall we were cleaning out some old toys and came across one of these monkeys. When we launched it, my youngest son (now 2) immediately burst into tears. So they are not a big hit at our house! At least not with 2-year-olds. I must disagree with this choice. These monkeys are so much FUN – definitely on our top 10 toy list. My youngest son loves monkeys & got a Flying Monkey as a gift when he was 4. We had to get more so that the older kids & adults could play too! We actually have a few at my office and they get flung around a lot. It’s a fun way to pass the time in our mundane work lives!!! I’m glad to see all the comments in defense of the slingshot monkey! It’s hilarious and definitely NOT a unitasker. Ours is loved by adults, dogs and kids alike. It would be a welcome stress reliever in any workplace! 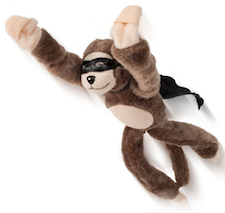 we have flying monkey office Olympics at work during customer service week… Love these things! Well, yeah, they’re unitaskers in that they do one thing, but it’s a good thing: they make [most] people laugh. I gave a flying monkey, flying frog, flying cow, flying sheep, and a couple of other flying critters to my work suitemates for Christmas one year, and we had a blast with them. I gave my parents (mid-70s) a pair of flying sock monkeys the same year, and all of their kids, grandkids, and granddogs loved them, too. First time commenting because I have to chime in that these flying monkeys are not unitaskers because they create both joy and terror. Dual purpose! One of the few items I’ve ever been really sorry to lose in a move. Actually, I’m going to buy this now. Thanks!